The Chipper Clipper: Hot Coupon: Classico Buy One, Get One Free! 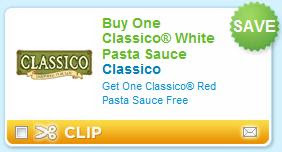 Coupons.com has added a hot Buy One Classico White Pasta Sauce and get one Classico Red Pasta Sauce free! Hurry because the last Classico coupon only lasted a day!